Systematic reviews and meta-analyses have become increasingly important in health care. Clinicians read them to keep up to date with their specialty,1 2 and they are often used as a starting point for developing clinical practice guidelines. Granting agencies may require a systematic review to ensure there is justification for further research,3 and some medical journals are moving in this direction.4 As with all research, the value of a systematic review depends on what was done, what was found, and the clarity of reporting. As with other publications, the reporting quality of systematic reviews varies, limiting readers’ ability to assess the strengths and weaknesses of those reviews. In 1996, to address the suboptimal reporting of meta-analyses, an international group developed a guidance called the QUOROM statement (QUality Of Reporting Of Meta-analyses), which focused on the reporting of meta-analyses of randomised controlled trials.8 In this article, we summarise a revision of these guidelines, renamed PRISMA (Preferred Reporting Items for Systematic reviews and Meta-Analyses), which have been updated to address several conceptual and practical advances in the science of systematic reviews (see box). The conduct of a systematic review depends heavily on the scope and quality of included studies: thus systematic reviewers may need to modify their original review protocol during its conduct. Any systematic review reporting guideline should recommend that such changes can be reported and explained without suggesting that they are inappropriate. The PRISMA statement (items 5, 11, 16, and 23) acknowledges this iterative process. Aside from Cochrane reviews, all of which should have a protocol, only about 10% of systematic reviewers report working from a protocol.9 Without a protocol that is publicly accessible, it is difficult to judge between appropriate and inappropriate modifications. The terminology used to describe a systematic review and meta-analysis has evolved over time. One reason for changing the name from QUOROM to PRISMA was the desire to encompass both systematic reviews and meta-analyses. We have adopted the definitions used by the Cochrane Collaboration.17 A systematic review is a review of a clearly formulated question that uses systematic and explicit methods to identify, select, and critically appraise relevant research, and to collect and analyse data from the studies that are included in the review. Statistical methods (meta-analysis) may or may not be used to analyse and summarise the results of the included studies. 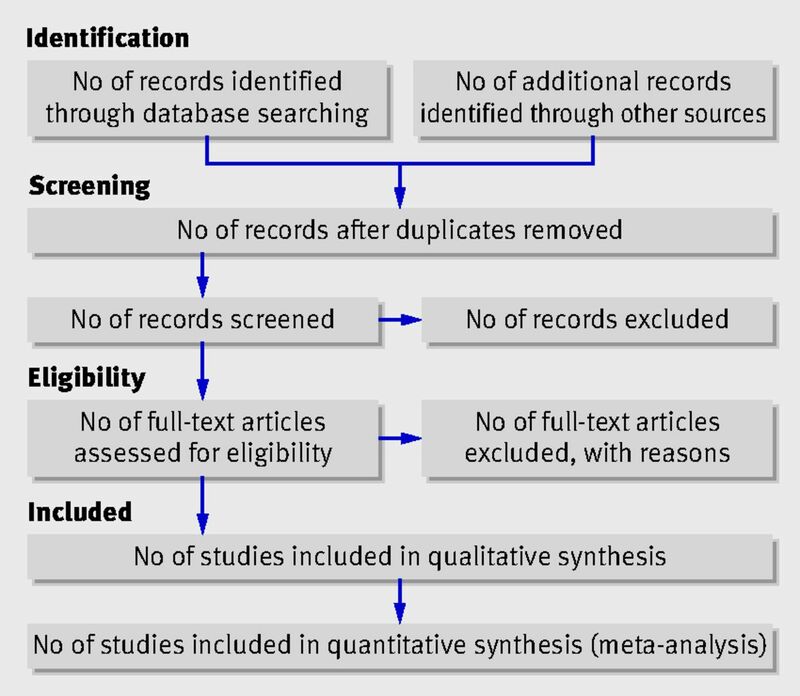 Meta-analysis refers to the use of statistical techniques in a systematic review to integrate the results of included studies. A three-day meeting was held in Ottawa, Canada, in June 2005 with 29 participants, including review authors, methodologists, clinicians, medical editors, and a consumer. The objective of the Ottawa meeting was to revise and expand the QUOROM checklist and flow diagram as needed. The executive committee completed the following tasks before the meeting: a systematic review of studies examining the quality of reporting of systematic reviews; a comprehensive literature search to identify methodological and other articles that might inform the meeting, especially in relation to modifying checklist items; and an international survey of review authors, consumers, and groups commissioning or using systematic reviews and meta-analyses (including the International Network of Agencies for Health Technology Assessment and the Guidelines International Network) to ascertain views of QUOROM, including the merits of the existing checklist items. The results of these activities were presented during the meeting and are summarised on the PRISMA website, www.prisma-statement.org/. Only items deemed essential were retained or added to the checklist. Some additional items are nevertheless desirable, and review authors should include these, if relevant.18 For example, it is useful to indicate whether the systematic review is an update of a previous review19 and to describe any changes in procedures from those described in the original protocol. Shortly after the meeting, a draft of the PRISMA checklist was circulated to the group, including those invited to the meeting but unable to attend. A disposition file was created containing comments and revisions from each respondent, and the checklist was subsequently revised 11 times. The group approved the checklist, flow diagram, and this summary paper. Although no direct evidence was found to support retaining or adding some items, evidence from other domains was believed to be relevant. For example, item 5 asks authors to provide registration information about the systematic review, including a registration number if available. Although systematic review registration is not yet widely available,20 21 the participating journals of the International Committee of Medical Journal Editors22 now require all clinical trials to be registered in an effort to increase transparency and accountability.23 Those aspects are also likely to benefit systematic reviewers, possibly reducing the risk of an excessive number of reviews addressing the same question24 25 and providing greater transparency when updating systematic reviews. The PRISMA statement consists of a 27 item checklist (table 1⇓) and a four phase flow diagram (figure⇓) (also available as extra items on bmj.com for researchers to download and re-use). The aim of the PRISMA statement is to help authors improve the reporting of systematic reviews and meta-analyses. We have focused on randomised trials, but PRISMA can also be used as a basis for reporting systematic reviews of other types of research, particularly evaluations of interventions. PRISMA may also be useful for critical appraisal of published systematic reviews. However, the PRISMA checklist is not a quality assessment instrument to gauge the quality of a systematic review. Flow of information through the different phases of a systematic review. The new PRISMA checklist differs in several respects from the QUOROM checklist, and table 2⇓ lists the substantive specific changes. Generally, the PRISMA checklist “decouples” several items present in the QUOROM checklist and, where applicable, several checklist items are linked to improve consistency across the systematic review report. The flow diagram has also been modified. Before including studies and providing reasons for excluding others, the review team must first search the literature. This search results in records. Once these records have been screened and eligibility criteria applied, a smaller number of articles will remain. The number of included articles might be smaller (or larger) than the number of studies, because articles may report on multiple studies and results from a particular study may be published in several articles. To capture this information, the PRISMA flow diagram now requests information on these phases of the review process. The PRISMA statement should replace the QUOROM statement for those journals that have endorsed QUOROM. We hope that other journals will support PRISMA; they can do so by registering on the PRISMA website. To emphasise to authors and others the importance of transparent reporting of systematic reviews, we encourage supporting journals to reference the PRISMA statement and include the PRISMA web address in their instructions to authors. We also invite editorial organisations to consider endorsing PRISMA and encourage authors to adhere to its principles. In addition to the PRISMA statement, a supporting explanation and elaboration document has been produced26 following the style used for other reporting guidelines.27 28 29 The process of completing this document included developing a large database of exemplars to highlight how best to report each checklist item, and identifying a comprehensive evidence base to support the inclusion of each checklist item. The explanation and elaboration document was completed after several face to face meetings and numerous iterations among several meeting participants, after which it was shared with the whole group for additional revisions and final approval. Finally, the group formed a dissemination subcommittee to help disseminate and implement PRISMA. The quality of reporting of systematic reviews is still not optimal.9 30 31 32 33 34 In a recent review of 300 systematic reviews, few authors reported assessing possible publication bias,9 even though there is overwhelming evidence for its existence13 and its impact on the results of systematic reviews.35 Even when the possibility of publication bias is assessed, there is no guarantee that systematic reviewers have assessed or interpreted it appropriately.36 Although the absence of reporting such an assessment does not necessarily indicate that it was not done, reporting an assessment of possible publication bias is likely to be a marker of the thoroughness of the conduct of the systematic review. We have developed an explanatory document to increase the usefulness of PRISMA.26 For each checklist item, this document contains an example of good reporting, a rationale for its inclusion, and supporting evidence, including references, whenever possible. We believe this document will also serve as a useful resource for those teaching systematic review methodology. We encourage journals to include reference to the explanatory document in their instructions to authors. Like any evidence based endeavour, PRISMA is a living document. To this end we invite readers to comment on the revised version, particularly the new checklist and flow diagram, through the PRISMA website. We will use such information to inform PRISMA’s continued development. The following people contributed to the PRISMA statement: Doug Altman, Centre for Statistics in Medicine (Oxford); Gerd Antes, University Hospital Freiburg (Freiburg, Germany); David Atkins, Health Services Research and Development Service, Veterans Health Administration (Washington DC, USA); Virginia Barbour, PLoS Medicine (Cambridge, UK); Nick Barrowman, Children’s Hospital of Eastern Ontario (Ottawa, Canada); Jesse A. Berlin, Johnson & Johnson Pharmaceutical Research and Development (Titusville NJ, USA); Jocalyn Clark, PLoS Medicine (at the time of writing, BMJ, London); Mike Clarke, UK Cochrane Centre (Oxford) and School of Nursing and Midwifery, Trinity College (Dublin, Ireland); Deborah Cook, Departments of Medicine, Clinical Epidemiology and Biostatistics, McMaster University (Hamilton, Canada); Roberto D’Amico, Università di Modena e Reggio Emilia (Modena, Italy) and Centro Cochrane Italiano, Istituto Ricerche Farmacologiche Mario Negri (Milan, Italy); Jonathan J Deeks, University of Birmingham (Birmingham); P J Devereaux, Departments of Medicine, Clinical Epidemiology and Biostatistics, McMaster University; Kay Dickersin, Johns Hopkins Bloomberg School of Public Health (Baltimore MD, USA); Matthias Egger, Department of Social and Preventive Medicine, University of Bern (Bern, Switzerland); Edzard Ernst, Peninsula Medical School (Exeter, UK); Peter C Gøtzsche, Nordic Cochrane Centre (Copenhagen, Denmark); Jeremy Grimshaw, Ottawa Hospital Research Institute (Ottawa, Canada); Gordon Guyatt, Departments of Medicine, Clinical Epidemiology and Biostatistics, McMaster University; Julian Higgins, MRC Biostatistics Unit (Cambridge, UK); John P A Ioannidis, University of Ioannina Campus (Ioannina, Greece); Jos Kleijnen, Kleijnen Systematic Reviews (York, UK) and School for Public Health and Primary Care (CAPHRI), University of Maastricht (Maastricht, Netherlands); Tom Lang, Tom Lang Communications and Training (Davis CA, USA); Alessandro Liberati, Università di Modena e Reggio Emilia, and Centro Cochrane Italiano, Istituto Ricerche Farmacologiche Mario Negri; Nicola Magrini, NHS Centre for the Evaluation of the Effectiveness of Health Care—CeVEAS (Modena, Italy); David McNamee, Lancet (London, UK); Lorenzo Moja, Centro Cochrane Italiano, Istituto Ricerche Farmacologiche Mario Negri; David Moher, Ottawa Methods Centre, Ottawa Hospital Research Institute (Ottawa, Canada); Cynthia Mulrow, Annals of Internal Medicine (Philadelphia PA, USA); Maryann Napoli, Center for Medical Consumers (New York, USA); Andy Oxman, Norwegian Health Services Research Centre (Oslo, Norway); Ba’ Pham, Toronto Health Economics and Technology Assessment Collaborative (Toronto, Canada) (at the time of first meeting of the group, GlaxoSmithKline Canada, Mississauga, Ontario); Drummond Rennie, University of California San Francisco (San Francisco CA, USA); Margaret Sampson, Children’s Hospital of Eastern Ontario (Ottawa, Canada); Kenneth F Schulz, Family Health International (Durham NC, USA); Paul G Shekelle, Southern California Evidence Based Practice Center (Santa Monica CA, USA); Jennifer Tetzlaff, Ottawa Methods Centre, Ottawa Hospital Research Institute; David Tovey, Cochrane Library, Cochrane Collaboration (Oxford, UK) (at the time of first meeting of the group, BMJ, London); Peter Tugwell, Institute of Population Health, University of Ottawa (Ottawa, Canada). Author contributions: ICMJE criteria for authorship read and met—DM. Agree with the recommendations—DM, AL, JT, DGA. Wrote the first draft of the paper—DM, AL, DGA. Contributed to the writing of the paper—DM, AL, JT, DGA. Participated in regular conference calls, identified the participants, secured funds, planned the meeting, participated in the meeting, and drafted the manuscript—DM, AL, DGA. Participated in identifying the evidence base for PRISMA, refining the checklist, and drafting the manuscript—JT. Funding: PRISMA was funded by the Canadian Institutes of Health Research; Università di Modena e Reggio Emilia, Italy; Cancer Research UK; Clinical Evidence BMJ Knowledge; the Cochrane Collaboration; and GlaxoSmithKline, Canada. AL is funded, in part, through grants of the Italian Ministry of University (COFIN-PRIN 2002 prot 2002061749 and COFIN-PRIN 2006 prot 2006062298). DGA is funded by Cancer Research UK. DM is funded by a University of Ottawa Research Chair. None of the sponsors had any involvement in the planning, execution, or writing of the PRISMA documents. No funder played a role in drafting this manuscript. Oxman AD, Cook DJ, Guyatt GH. Users’ guides to the medical literature. VI. How to use an overview. Evidence-Based Medicine Working Group. JAMA1994;272:1367-71. Swingler GH, Volmink J, Ioannidis JP. Number of published systematic reviews and global burden of disease: database analysis. BMJ2003;327:1083-4. Canadian Institutes of Health Research. Randomized controlled trials registration/application checklist (12/2006). 2006. www.cihr-irsc.gc.ca/e/documents/rct_reg_e.pdf (accessed 19 May 2009). Young C, Horton R. Putting clinical trials into context. Lancet2005;366:107. Mulrow CD. The medical review article: state of the science. Ann Intern Med1987;106:485-8. Sacks HS, Berrier J, Reitman D, Ancona-Berk VA, Chalmers TC. Meta-analysis of randomized controlled trials. N Engl J Med1987;316:450-5. Sacks HS, Reitman D, Pagano D, Kupelnick B. Meta-analysis: an update. Mt Sinai J Med1996;63:216-24. Moher D, Cook DJ, Eastwood S, Olkin I, Rennie D, Stroup DF, for the QUOROM group. Improving the quality of reporting of meta-analysis of randomized controlled trials: The QUOROM statement. Lancet1999;354:1896-1900. Moher D, Tetzlaff J, Tricco AC, Sampson M, Altman DG. Epidemiology and reporting characteristics of systematic reviews. PLoS Med2007;4:e78, doi:10.1371/journal.pmed.0040078. Moja LP, Telaro E, D’Amico R, Moschetti I, Coe L, Liberati A. Assessment of methodological quality of primary studies by systematic reviews: results of the metaquality cross sectional study. BMJ2005;330:1053-5. Guyatt GH, Oxman AD, Vist GE, Kunz R, Falck-Ytter Y, Alonso-Coello P, et al, for the GRADE Working Group. GRADE: an emerging consensus on rating quality of evidence and strength of recommendations. BMJ2008;336:924-6. Schunemann HJ, Jaeschke R, Cook DJ, Bria WF, El-Solh AA, et al, for the ATS Documents Development and Implementation Committee. An official ATS statement: grading the quality of evidence and strength of recommendations in ATS guidelines and recommendations. Am J Respir Crit Care Med2006;174:605-14. Dickersin K. Publication bias: recognizing the problem, understanding its origins and scope, and preventing harm. In: Rothstein HR, Sutton AJ, Borenstein M, eds. Publication bias in meta-analysis—prevention, assessment and adjustments. Chichester: John Wiley, 2005:11-33. Chan AW, Hrobjartsson A, Haahr MT, Gøtzsche PC, Altman DG. Empirical evidence for selective reporting of outcomes in randomized trials: comparison of protocols to published articles. JAMA2004;291:2457-65. Green S, Higgins J, eds. Glossary. Cochrane Handbook for Systematic Reviews of Interventions 4.2.5 [updated May 2005]. www.cochrane.org/resources/glossary.htm (accessed 19 May 2009). Strech D, Tilburt J. Value judgments in the analysis and synthesis of evidence. J Clin Epidemiol2008;61:521-4. University of York. Centre for Reviews and Dissemination, 2009. www.york.ac.uk/inst/crd/ (accessed 19 May 2009). Joanna Briggs Institute. Protocols & work in progress, 2008. www.joannabriggs.edu.au/pubs/systematic_reviews_prot.php (accessed 19 May 2009). De Angelis C, Drazan JM, Frizelle FA, Haug C, Hoey J, et al, for the International Committee Medical Journal Editors. Clinical trial registration: a statement from the International Committee of Medical Journal Editors. CMAJ2004;171:606-7. Whittington CJ, Kendall T, Fonagy P, Cottrell D, Cotgrove A, et al. Selective serotonin reuptake inhibitors in childhood depression: systematic review of published versus unpublished data. Lancet2004;363:1341-5. Bagshaw SM, McAlister FA, Manns BJ, Ghali WA. Acetylcysteine in the prevention of contrast-induced nephropathy: a case study of the pitfalls in the evolution of evidence. Arch Intern Med2006;166:161-6. Biondi-Zoccai GG, Lotrionte M, Abbate A, Testa L, Remigi E, et al. Compliance with QUOROM and quality of reporting of overlapping meta-analyses on the role of acetylcysteine in the prevention of contrast associated nephropathy: case study. BMJ2006;332:202-9. Liberati A, Altman DG, Tetzlaff J, Mulrow C, Gøtzsche PC, Ioannidis JPA, et al, for the PRISMA Group. The PRISMA statement for reporting systematic reviews and meta-analyses of studies that evaluate healthcare interventions: explanation and elaboration. BMJ2009;339:b2700. Altman DG, Schulz KR, Moher D, Egger M, Davidoff F, et al, for the CONSORT group. The revised CONSORT statement for reporting randomized trials: explanation and elaboration. Ann Intern Med2001;134:663-94. Bossuyt PM, Reitsma JB, Bruns DE, Gatsonis CA, Glasziou PP, et al, for the STARD group. Towards complete and accurate reporting of studies of diagnostic accuracy: the STARD explanation and elaboration. Ann Intern Med2003;138:W1-12. Vandenbroucke JP, von Elm E, Altman DG, Gøtzsche PC, Mulrow CD, et al, for the STROBE initiative. Strengthening the reporting of observational studies in epidemiology (STROBE): explanation and elaboration. Ann Intern Med2007;147:W163-94. Bhandari M, Morrow F, Kulkarni AV, Tornetta P. Meta-analyses in orthopaedic surgery: a systematic review of their methodologies. J Bone Joint Surg Am2001;83-A:15-24. Kelly KD, Travers A, Dorgan M, Slater L, Rowe BH. Evaluating the quality of systematic reviews in the emergency medicine literature. Ann Emerg Med2001;38:518-26. Richards D. The quality of systematic reviews in dentistry. Evid Based Dent2004;5:17. Choi PT, Halpern SH, Malik N, Jadad AR, Tramer MR, et al. Examining the evidence in anesthesia literature: a critical appraisal of systematic reviews. Anesth Analg2001;92:700-9. Delaney A, Bagshaw SM, Ferland A, Manns B, Laupland KB. A systematic evaluation of the quality of meta-analyses in the critical care literature. Crit Care2005;9:R575-82. Sutton AJ. Evidence concerning the consequences of publication and related biases. In: Rothstein HR, Sutton AJ, Borenstein M, eds. Publication bias in meta-analysis—prevention, assessment and adjustments. Chichester: John Wiley, 2005:175-92. Ladabaum U, Chopra CL, Huang G, Scheiman JM, Chernew ME, et al. Aspirin as an adjunct to screening for prevention of sporadic colorectal cancer: a cost-effectiveness analysis. Ann Intern Med2001;135:769-81. Altman DG. Systematic reviews of evaluations of prognostic variables. BMJ2001;323:224-8. Ioannidis JP, Ntzani EE, Trikalinos TA, Contopoulos-Ioannidis DG. Replication validity of genetic association studies. Nat Genet2001;29:306-9. Lavis J, Davies H, Oxman A, Denis J, Golden-Biddle K, et al. Towards systematic reviews that inform health care management and policy-making. J Health Serv Res Policy2005;10:35-48. Stewart LA, Clarke MJ. Practical methodology of meta-analyses (overviews) using updated individual patient data. Cochrane Working Group. Stat Med1995;14:2057-79.